Your diet is making you fat. Forget the fads and finally lose weight for good with 10 simple rules--and no BS. We're addicted to fad diets, cleanses, and programs that promise miracles in minutes. But when diets have expiration dates, so do the results. After those popular 30-day diets end, people slide back into the same bad habits that led them to gain weight in the first place. Nationally recognized nutrition expert Brooke Alpert has seen this happen far too often. She knows that in order to lose the weight and keep it off, you must develop habits that will help you stop dieting and start eating well for the rest of your life--not just the rest of the month. This is not a demanding, complicated program that leaves you hanging after you're finished reading--this is a lifestyle manual that will help you form healthy eating habits that last the rest of your life. 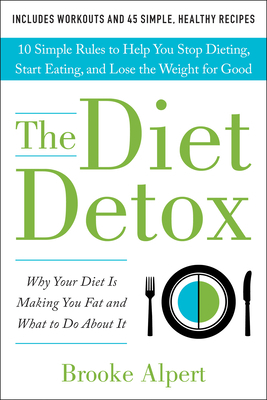 The Diet Detox is the practical, non-diet diet book that everyone should read, whether they want to lose weight, get healthy, or just stay that way. Brooke's 10 simple rules will be the last you'll ever need: stop dieting and take control of your weight and your health--for good. Brooke Alpert, MS, RD, CDN, is a nationally recognized nutrition expert and author. She is the founder of B Nutritious, www.b-nutritious.com, a private nutrition counseling and consulting practice in New York City. Brooke's expertise and nutrition knowledge has lead her to be featured on national television regularly including, The Doctor Oz Show, The Today Show, Access Hollywood and more. She was named one of the new up and coming stars in the beauty and health field in W Magazine and has been quoted and featured extensively in both national and international magazines including People, Shape, Glamour, Town & Country, Tatler and more. Brooke received her Masters of Science at New York University and completed her training at Mt. Sinai Hospital in affiliation with NYU. She is an active member of the Academy of Nutrition and Dietetics. Brooke, a former equestrian is also a tri-athlete and a lover of mud runs. She resides in New York City with her husband and their two daughters.